Theater is a strange art form, maybe the strangest. It involves a series of exchanges between artists involved in completely different disciplines. A lot of art involves staking ground, declaring a voice, asserting a style, evoking and provoking. It's active, even sometimes aggressive. The exchanges in theater involve a different mindset. They're acts of surrender. The playwright writes alone in a room, imagining characters, putting words in their mouths. The playwright hands over the script to the director, who has to listen to the playwright, because the director can't change a single word without the playwright's approval, because the playwright owns the play's copyright-unlike the screenwriter in cinema. The director, listening to the written word, imagines the stage world where the words will live, and casts the actors, giving it over to them. The actors take it from there, owning the play as long as it remains on stage. The actors surrender themselves, through the prism of their characters, to the audience, but make no mistake: The actors rule the theater at the end of the day. Those who surrendered have surrendered to these creatures who become somebody else two hours every night. The whole thing, strange. Strange as a dream. This system of surrender and transformation is a fascinating and paradoxical subject for the cinema, which is all about conquering territory and not surrendering an inch. (It may be part of why men still tend to dominate cinema, why deep into our supposedly post-feminist age women continue to have a terrible time finding positions of creative power in cinema.) A student and proud product of the renowned Universidad del Cine in Buenos Aires-the real incubator of much of what we think of as young Argentine cinema- Matías Piñeiro has written and directed movies all about these surrenders and identity shifts, increasingly under the guise of theater. It's misguided to term the movie you're about to watch as "Matías Piñeiro's Viola" or, say, "Viola (Matías Piñeiro, Argentina)" He's the guide of the movie, the writer-director, but he doesn't own it. Once written, he gives it over to his actors, a regular ensemble of supremely gifted players mostly trained in theater, and collectively, they make the movie together. Viola, like everything they've made before, is a group project with no true author. The auteur theory itself is challenged here. That easy, now knee-jerk way of looking at all art cinema must be seriously questioned and re-examined: Are movies "authored" at all? Where does the authorship begin and end? In theater, that answer unquestionably is: the playwright, because even though the actors own the play for awhile on stage, it reverts back to the playwright once the production closes. There are many interpretations, but only one written play. Moviemaking-there's no "filmmaking" anymore, not in the strict sense of the word, not with the demise of the photochemical material we call "film"-is the ultimate group project. Since "Un hombre robado," the fleet first feature Piñeiro wrote and directed, these projects have always had the feeling of bright young people getting together and putting on a show. As Argentine critic Quintin has commented, they stand utterly apart from anything else being made in Argentina, though I would amend that by noting the overlap of actors, rapid-fire line deliveries and funny-serious tone shared by the amazing "Castro," written and directed by Alejo Moguillansky and the astounding masterpiece, "Extraordinary Stories," written and directed by Mariano Llinas. 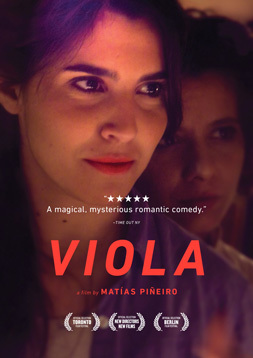 And in the rest of Latin American cinema, a movie like Viola has a relationship only with the trans-cinema-theater work of Eduardo Coutinho, who continues to investigate the realities and limits of stage performance filtered through the cinema eye. Coutinho and his company of actors tend not to drift outside the proscenium. Piñeiro and Co. drift everywhere, from green rooms to the backseats of cars, while retaining the essential strangeness of theatrical exchange/surrender. Viola spins off a dialogue between Olivia and Viola in Act I of Shakespeare's Twelfth Night, repeated several times during the playing (and this playing involves some of the same actor-characters both in costume and out, on stage and at home supposedly running lines), with the comedy's text blurring into the movie's own, until no line separates the stage from life. And this culminates in the movie's extraordinary centerpiece, which resolves the first half's storyline (a "plot" to seduce a would-be boyfriend, faintly echoing a storyline in Shakespeare's comedy) and launches a new story which ends Viola. Actor Cecilia (Agustina Muñoz) sits in her car with Viola (Maria Villar), who delivers DVDs and CDs by bicycle to subscribers around Buenos Aires. Gradually, Viola becomes inculcated in Cecilia's strange world of acting, partly through the course of a dream (subtly denoted by a change in the weather), until she's literally cast in the production that Cecilia and her company is doing-not exactly a production of Twelfth Night, but a compressed amalgam of Shakespeare's high masterpieces, of which Twelfth Night is arguably the highest. (Piñeiro and Co. glanced at another high comedy masterpiece, As You Like It, with the effervescent short they made prior to Viola, titled Rosalinda and featuring almost exactly the same set of actors.) Cecilia, with her fellow actor Ruth-who happens to be Viola's friend and walking past Cecilia's car-commit the theatrical act of surrendering to Viola, creating a space for her to step into, an acting space, and Viola suddenly reveals that she knows some Shakespearean text, which may or may not be part of the dream, which, Viola is telling us, is the essence of theater. And in this surrender, Viola takes over Viola in the cinematic sense: The action shifts invisibly to her point of view. The other actors are now off-screen, the camera trained only on her, a woman we've barely come to know but utterly asserts her space. Earlier in Viola, the women of the company discuss the element of seduction, "the game of conquest" permitting "having everything against you so as to have him conquered by the force of seduction." The movie surrenders this story of seduction, unexpectedly. It's usurped by a more interesting player, this Viola, this bicycling woman depositing home entertainment at people's doors, whose story equally unexpectedly takes a poignant turn just before the closing credits. Her voice on the soundtrack reveals that the final scene is being recalled in her head at some later date, the moment when she thought she truly loved her boyfriend Javier (Esteban Bigliardi) and the moment when that love began to dissolve. Viola, like an actor removing a mask, begins as a comedy and ends as something else, not a tragedy exactly, but in the land of saudade. All in an hour.